On February 19, 1924, Lee Simeone was born in Chicago. 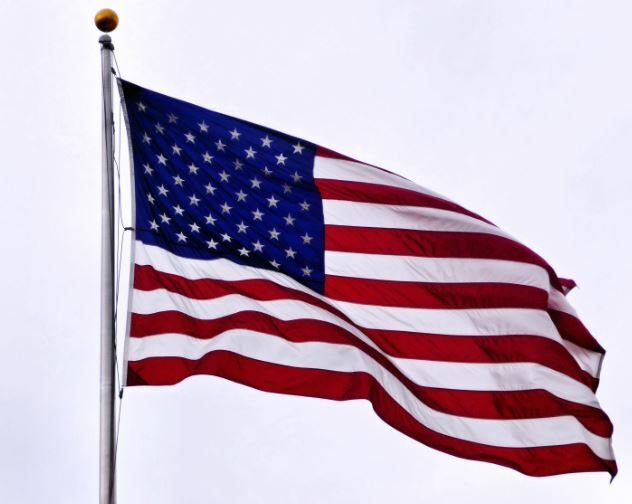 Around the time of the United States’ entry into World War II, a young Simeone enlisted into the Marine Corps; he was honorably discharged at the end of the war in 1945. Returning home to Chicago, the 21-year-old Simeone found work in the industrial sector, learning the art of making tools and dies. Simeone continued to make tools and dies for a number of companies in the Chicagoland area, improving his skills everywhere he went, for 14 years. Then, in 1959, the now 35-year-old Simeone founded Manor Tool & Manufacturing Company. Over the more than 50 years since our founding, Manor Tool has become a well-respected leader of the metal stamping industry. The Manor Tool name is synonymous with quality. This is a reputation that we have worked hard over the years to attain. In everything we do, from prototype design to finishing processes and assembly, quality of work is our number one goal. Every part that we manufacture at Manor Tool is subjected to quality assurance protocols at every stage of production. Raw materials, tools and dies, prototypes, stamped parts, and assembled parts are all inspected for quality. 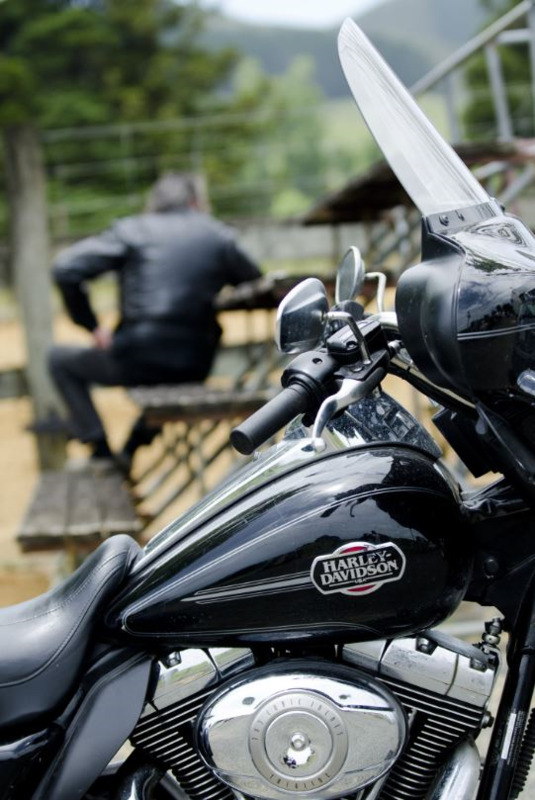 Finally, each completed part undergoes quality inspection before being made available for delivery. Part of the reason Manor Tool is so well known for the quality of our parts is because of our efforts at continuous improvement. The moment something stops improving—be it a part, a technology, an industry, or a company—is the moment that it becomes irrelevant. To ensure our continuous improvement, Manor Tool never rests on its laurels. 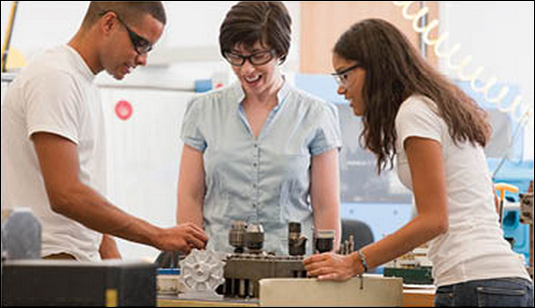 We are always looking for ways to advance our skills, capabilities, and processes. One way in which we do this is by holding regular Kaizen Events. “Kaizen” translates from Japanese as “change for better.” At a Kaizen event, Manor Tool team members from a variety of departments gather to evaluate a process and recommend changes to it. Using Kaizen events, Manor Tool has been able to improve in every way—we have increased productivity, grown revenue, improved employee safety, and enhanced customer satisfaction. On October 2nd, more than 2,500 businesses across the nation took part in Manufacturing Day, a manufacturing-minded day in which industrial production companies open the doors of their facilities to the public. 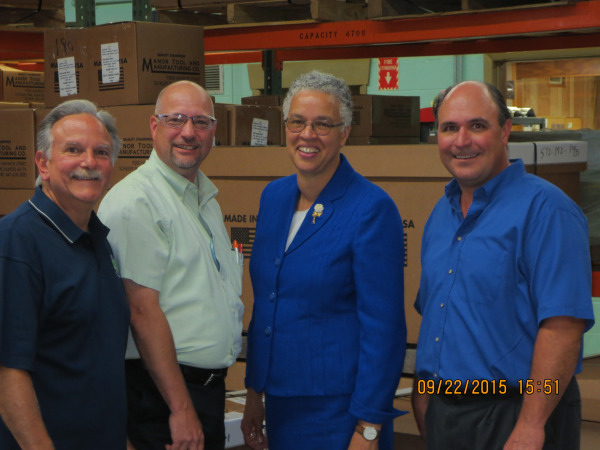 Among some of this year’s many participants was Cook County President Toni Preckwinkle, who attended our open house at Manor Tool & Manufacturing Company. There, President Preckwinkle toured our modernized industrial setting, noting the opportunities Manufacturing Day offers to people eager to learn more about industrial careers. Preckwinkle acknowledged a valuable truth about National Manufacturing Day — while it’s undoubtedly beneficial for corporations to interact and receive feedback from the general public, Manufacturing Day also provides an incredible outlet for burgeoning students to familiarize themselves with a field they are passionate about. The opportunity presented by Manufacturing Day for students can, in turn, result in a positive future for corporations, as well. 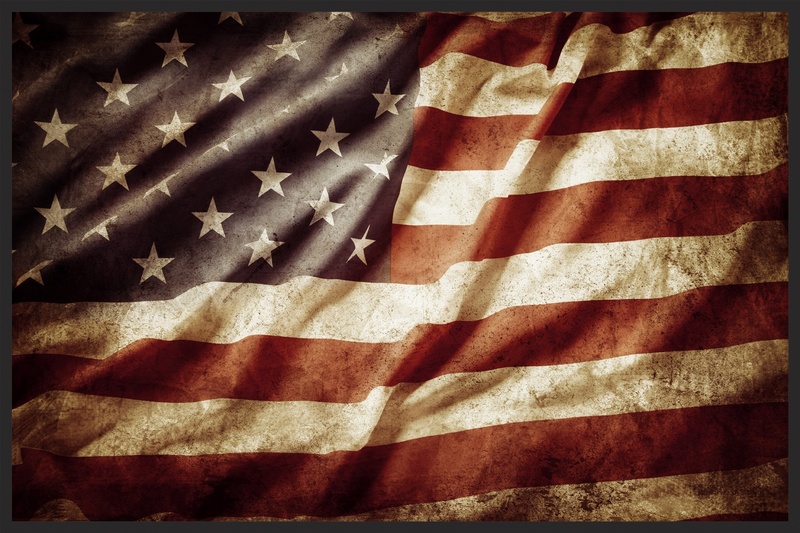 Thus, Manufacturing Day proves a catalyst for a cyclical process in which manufacturers give to students, and in which students will, hopefully, give back to manufacturers. President Preckwinkle, who has been committed to the support and growth of manufacturing careers for some time, used the platform to discuss the industrial field and its benefits. Manor Tool was founded in 1959 as a tool and die shop and since that time has grown to be a recognized leader in manufacturing, providing customers with modern and technology driven metal stamping. Manor specializes in punching, bending, forming, and deep drawn stampings in more than 44,000 square feet of manufacturing space and state-of-the art equipment and machinery. Improving a business is an easy idea to agree with but a much harder one to implement. Finding areas that need improvement and making changes accordingly is one of the most difficult ideas to quantify. Systematically improving performance on a continuous basis is very difficult for most industries to do on their own. We were also looking for ways to make improvement a continuous and structured effort when we learned about Kaizen Events. This approach engages the employees in determining where improvements can be made and how to successfully implement solutions. By improving the process, we reduced inefficiencies and increased the quality of the final products. Because we have been extremely successful with the Kaizen approach, we produced a new eBook to outline how this can be used to improve manufacturing operations as well as any other business structure. 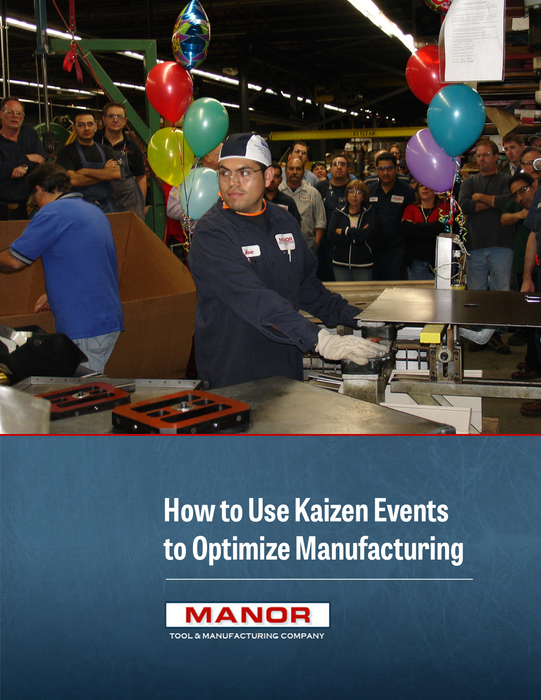 How to Use Kaizen Events to Optimize Manufacturing offers a glimpse inside Manor Tool and our drive to improve company performance. Sometimes, the greatest obstacle to modifying or changing a process is the idea that “that’s the way it has always been done.” With Kaizen events, the issue isn’t to tear processes down but to build them up through improvements that have been carefully evaluated through knowledgeable discussions. Having experienced this process first hand, we believe that Kaizen events are well worth the time and effort. We have used Kaizen events to target improvements in safety and efficiency throughout the company and continue to improve our processes for our employees and our clients. Download How to Use Kaizen Events to Optimize Manufacturing for free from our website today to begin the process of optimizing your operation. Manor serves a variety of clientele, so it is vital for us to constantly keep up with the latest technological advancements and offerings to help our customers with all their project requirements. As a result, we are always acquiring new machines to stay flexible and competitive. We’ve previously introduced you to “Freddy,” our robotic work cell designed to dramatically reduce cycle times and add innovation to our automated metal stamping processes. We’ve also talked about our C5 Express Press, a high-tech turret press, a more cost-effective option for smaller order sizes such as prototyping and initial development. We are now proud to present the Hammond Roto-Finish HR-17CPT, our new deburring machine work cell. It features a working capacity of 12 cubic feet (481 liters), heavy duty welded steel construction with a certified pressure vessel tank head that operates as the main building component of the bowl, and a polyurethane lining, with an additional 50% lining in high wear areas. The Hammond Roto-Finish has a U-shaped curved wall processing bowl, a full 90° wrap-around separation screen, a pneumatic operated discharge gate with a manual pneumatic valve standard. This design allows us to change various deburring media quickly and efficiently. This is a significant improvement over our old deburring machine, which required us to separate parts from media via magnets, and change out media manually. Thanks to the Hammond Roto-Finish, we can now produce more parts with less handling. A new jib crane also leads to more efficient loading and unloading of parts and different media, easing the burden on our operators, which increases safety measures throughout our facilities. Previously, we had to add soap and water manually, which had led to some rust and corrosion of parts if it wasn’t handled correctly. We also needed to dry parts in dusty corn cob in a mixer. This was a very labor-intensive process. Parts that run through the Hammond Roto-Finish are cleaner and require less labor. Water and soap are now automatically programmed into the system. Added to the cell was a new Holland spin dryer to eliminate the dusty corn cob drying process. The new Holland spin dryer quickly heats and dries parts. This allows us to package cleaner and dryer parts faster for shipment. Contact us today to see how the Hammond Roto-Finish can save you big on your next project.